The Likebook Mars is a new 7.8-inch ebook reader that runs Android 6.0, and it’s the first E Ink device to come with an octa-core processor. I thought it would be interesting to compare it to the 7-inch Kindle Oasis 2 with a dual-core processor, where the performance increase is so minimal over the other Kindles with single-core processors that Amazon doesn’t even bother to mention it. Does an octa-core processor really matter when it comes to reading ebooks? No, not really. The Kindle Oasis is faster and more responsive than the Likebook Mars in most respects. It loads books and PDFs slightly faster, it turns pages slightly faster, comicbooks and night mode look much better with full screen refresh, and it adds a number of extra reading features. The Likebook has some advantages of its own aside from the processor, including a microSD card slot, a headphone jack, and a dual-color frontlight (warm and cool). It can also install apps, including the Kindle app, which runs pretty well (but it’s slower than the Kindle Oasis and the fonts aren’t optimized for E Ink). The fact that the Kindle Oasis is just as fast if not faster in most respects, it’s pretty obvious that having more cores doesn’t really matter when it comes to ereading. But it does have some advantages in other ways. The Likebook Mars is much faster than other Android ereaders with single and dual-core processors, but the performance difference with quad-core devices like Onyx’s newer ereaders is minimal. Having a processor with 20 cores still isn’t going to solve the age old problem of Android apps not being designed to run on E Ink screens. There’s still lots of ghosting and problems with images and menus not displaying properly. The Likebook suffers from this more than the Onyx Boox Note, for instance, because Likebook’s software doesn’t refresh as often as it should with 3rd party apps. The Kindle may have a slower processor but it proves that having software that is optimized for E Ink screens is better than having a faster processor with more cores. Both devices sell for about the same price. The Likebook Mars sells between $239 and $269 at Amazon (the price fluctuates, and it does include a cover) and the Kindle Oasis starts at $249 and goes up to $349 for the 32GB model with free cellular wireless. Would you be able to compare the LIkeBook Mars and the Onyx Boox Note S together ? It would be really helpful also to see how they perform running the overdrive / Libby app 🙂 ? I like the 10.3 Note much better than the Note S so I got rid of the latter as soon as I was done reviewing it. When I tried the Libby app on the Note it wouldn’t get passed the login screen. The Overdrive app works okay but the font choices are poor for E Ink and the page refresh is distracting. I’ve been using the Kindle app to read library books because it works better than the Overdrive app. There are other reasons why more processor cores does not necessarily convert to better performance for e-readers. 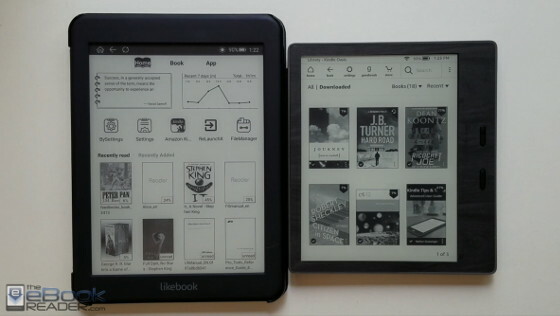 Devices like the Kindle (and Nook and Kobo) readers have their software compiled specifically for their hardware configuration, so they are MUCH more efficient at using resources. If you own a Kobo reader that you patch, you will have noticed there are multiple versions of each new software release. The version used by each device is dependent on the hardware for each device. I only own one Kobo device, but I believe that I have read from people who have multiple devices that the software is essentially the same with small exceptions for things like the comfort light. This further supports my theory that the software is compiled for each specific hardware configuration. I would rather see new devices come with more RAM than more processor cores. More RAM means it can hold more of large books (like the Bible for instance) in RAM and thus will have a better response time when navigating around and searching. I have a Likebook Plus (T80s) and seems slower than Mars. Mars has a eight-core processor, but, is it possible Android 6 is faster than 4.2.2 ? I thought older Android versions were lighter than newer and they would run worse on limited hardware devices. I think having 2GB of RAM makes a big a difference too with these Android ereaders. The Note S only has 1GB and I was having more problems with it than the regular Note with 2GB, and that was about the only difference specs-wise.